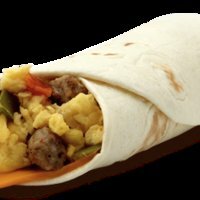 Yes, you can have a Low Carb Breakfast Burrito with sausage, peppers, onion and cheese. Just use a wheat tortilla (rather than a flour tortilla) or use a low carb tortilla. Low carb tortillas are available from a number of specialty companies and at most grocery stores. Look for all natural ingredients and, depending on the size of the tortilla, the net grams of carbs each has. Smaller ones should net out at 3-5 grams. Large tortillas may have 7-9 grams of carbohydrates. You should be able to find tasty low carb tortillas in a variety of flavors as well. If you wish to further reduce your carbs, you can use scrambled egg whites (no yolks). 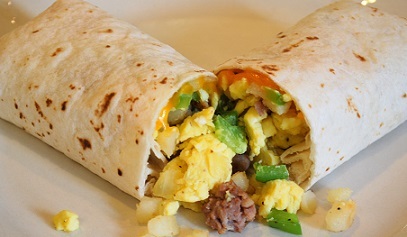 Enjoy your low carb breakfast burrito recipe and the company of those you share it with! Did you know? Before the development of the modern burrito, the Mesoamerican people of Mexico used tortillas to wrap foods, with fillings of chili peppers, tomatoes, mushrooms, squash, and avocados. The Navajo people of the Southwestern United States also made tortillas with beans and meat sauce fillings prepared much like the modern burrito.